Ask me about cartoon shows for kids 5 years and under and I will probably tell you all about them. I really can’t believe I traded my grown up shows for cartoons… but’s that’s life uh? Anyway, SUPER WHY is in that long list of cartoons that now I am so familiar with. What??? You don’t know them??? Well, here’s a picture of them. They are kinda cool, but I still don’t understand the pig among children super heroes. 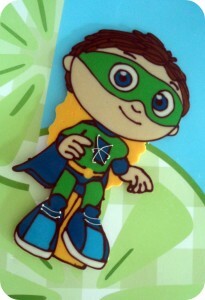 My target this weekend was the green super hero, Whyatt Beanstalk. A dear friend of mine, Yolanda (I’m sure she won’t mind me sharing her name here) asked me to make a chocolate piece of this little character for her son’s birthday party cake. She would be making the cake at home and I would provide the image for her. Here’s the chocolate piece that was recreated for the cake. Cute uh? I really liked it and people at the party did also. Yolanda came over the house with her cake and we set the image on top of it. It looked really nice, but I don’t have a picture of her finished cake. She promised to send me a picture of it though. About two years ago, her son was very much into Sesame Street. If you are interested here’s a link to the Elmo cake I made for her back in 2009. My friend is a very crafty person and she made super hero capes for every child at the party as her thank you favors. My kids had fun at the party and they are still playing with their capes.